When do we stop and say, I deserve more? When do the chains of the past get broken? Who are we waiting for to fix it all? When do we stop crying and find resolve? When do the wounds close and the scars heal? Who are we waiting for to make it go away? Today is my Grandma Jewell's funeral. I'm wearing a purple shirt, the light purple strapped watch I bought my grandmother (purple and pink were her favorite colors), some black slacks, and a black sweater. I'm also wearing some of the costume jewelry my aunt gave me after my grandmother passed. It comforts me to know it belonged to my grandmother. I'm not sure what I'm feeling at the moment. I've used Facebook postings as the vehicle for my all too public grief, but I hope that that grief was seen more as a celebration of the life that my grandmother led. I want to thank each and every one of my friends for allowing me to grieve that way and for posting such nice comments. I know death is usually something we keep wrapped up and deal in our own way, but I wanted to share her because nobody else will ever know her again. I think about all her travels and all the people she has met. Anyone who ever met her was charmed. She has probably touched SO many lives but they don't know she's gone. I designed a funeral program for my grandmother. It is a 5 inch by 7 inch booklet, and I regret that there were some typos in it, so for that, I beg the family's forgiveness. I want to reproduce the text here in my blog in its entirety. E. Jewell Beck led a life most only dream of having. Loving daughter, sister, Sacred Harp singer, cadet nurse, exceptional wife, mother, grandmother, great grandmother, and great-great grandmother, hospital and nursing home administrator, world traveler, lover of higher education, Red Hat Sister, confidante, and so much more. 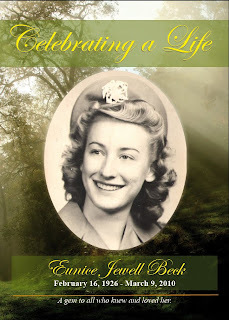 E. Jewell Beck was born as Eunice Jewell Bennett in Manchester, Alabama into the loving arms of her father and mother, M.E. and Annie Lou Bennett, on February 16, 1926. Jewell, as she liked to go by, was one of 13 Bennett children. They grew up close to nature and the Lord. She and her siblings helped their parents grow and harvest most of the food they ate, and she was no stranger to hard work. Jewell loved Sacred Harp singing, a traditional shape note choral music, and often sang with her father. In fact, her first trip out of the State of Alabama was to go to Meridian, Mississippi for Sacred Harp singing with her father. When Jewell graduated from Curry High School on May 8, 1945, she enlisted in the Cadet Nurse Corps. She traveled to Nashville, Tennessee to begin nurses training. It was her second time out of the state. She graduated in June 1948, with a Nursing Diploma and an Associates Degree in Nursing Science and a desire to see the world. In 1948, Jewell was engaged to be married to Richard Griffith, and worked as a surgical nurse at Walker County Hospital in Jasper, Alabama. She was married at her parent’s home on December 24, 1948. When Richard was discharged from the Army in 1949, they moved to Los Angeles, California. Their first son, William Emmett Griffith, was born on September 25, 1949. Three more children followed. Daughter Kathryn was born on February 6, 1953, and son Michael Richard was born on July 23, 1954. Daughter Khrystina was born on February 26, 1957. Richard became a Los Angeles police officer, while Jewell worked at various hospitals and clinics, including the Los Angeles General Hospital, Rancho Los Amigos Poliomyelitis Respiratory Center, Inglewood, and Huntington Park Children’s Hospital in various nursing positions. Richard and Jewell moved to the City of Orange and bought their first home there. While living in Orange, Jewell worked with Dr. Grahm Gilmore for 14 years. She was the go-to person when children were sick or injured in the neighborhood. Richard became a police detective for the City of Orange. Jewell was a loving and adventurous mother who was not only interested in but interesting to her four children. Jewell took her children hot air ballooning, vacationing all over the country, including two favorite places Palm Springs and Mexico, took them regularly to the beach, and a rock concert or two. Jewell’s children characterize her as a tender mother who never raised her voice to them. While sometimes working two jobs, Jewell still found the time to bond with her children, whether it was teaching her daughter Kathy to sew, taking tennis lessons with Tina, scouting with Bill, or baseball with Mike, she always found the time. She even sewed her childrens’ clothing and costumes. Jewell continuously sought to improve herself through education. Jewell earned her Bachelor of Science Degree in Nursing Science at Long Beach State University in 1971. In 1976, she earned her Masters Degree in Human Resources Development from Redlands University, California, and in 1978, obtained her Masters in Psychiatric Nursing, and joined the faculty at UCI Medical Center. Jewell was able to visit almost every state in the continental United States. She traveled by plane, automobile, and motor home. But Jewell also had the opportunity to travel the world. In 1971, Jewell and Richard were recruited to join the staff and crew of Chapman University’s “World Campus Afloat,” an ocean liner that sailed from the west coast of the United States around the world for a semester at sea. Jewell served with a medical team of two nurses, a surgeon, and a dentist in the ship’s hospital on the return home. She often said the Ports of Call were more than she could recall. In 1979, Richard died following a long illness with cancer. In 1979, Jewell was granted a sabbatical and went with a group of psychiatric nurses and physicians to Russia to observe psychiatric practices there. They were given guided tours of Moscow, the Red Square, the Kremlin, Ibilisi, Yerevan, Azerbaijan, Baku, Kiev, and Leningrad. In 1980, Jewell traveled to visit her sister Ann and her husband Sergeant Major J.W. Frye in Germany, and they traveled around Europe for two weeks. In 1982, Jewell went to China with a medical group to witness acupuncture, herbal medicine, and a close up observation of the “barefoot doctors” of inland China. She walked the Great Wall of China, and traveled to Shanghai, Peking, Hong Kong, the Philippines, and the Hawaiian Islands before returning home. In 1983, Jewell went to Kenya, Africa, with a group of nurses to tour hospitals, and flew with flying bush doctors to remote areas of Kenya, often witnesses both modern and primitive medical practices. In 2002, Jewell once again traveled to England, France, Ireland and other places in Europe with her Red Hat Sister, Ruby. Jewell joined the Red Hat Society in 2001. The Red Hat Sisters say, “We are the women in the red and pink hats. We are the ones enjoying life to the fullest, no matter where we are or what we are doing! We are the mothers, daughters and grandmothers of society. Some may ask, ‘What do you do?’ The answer is... We do exactly what we wish to do.” Jewell lived every word of that saying. While in the Red Hat Society, she walked in parades, traveled to various cities and locales in Southern California, participated in social functions, and loved her Red Hat Sisters. 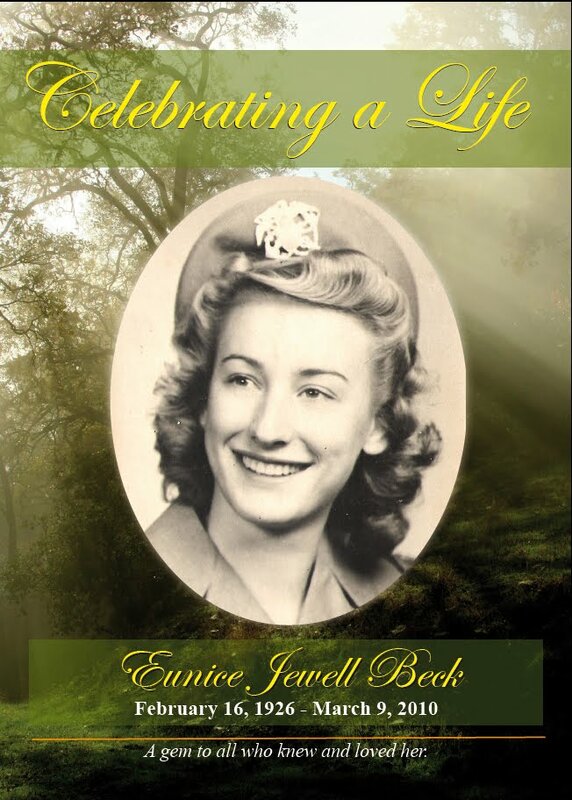 In 1986, Jewell met Kenneth R. Beck, the widowed father of two young physicians. She retired and married Ken on January 7, 1987. Ken was a Retired Marine Corps Pilot who served in World War II, Korea, and Vietnam. Jewell sold her house and moved in with Ken in a house in the North Tustin area of Orange County. In 14 years, they rarely spent a day apart. He was with Flying Tiger Airlines for 12 years, and then became the Executive Pilot for the Owner/Publisher of Knight-Rider News Service/Long Beach Press Telegram. Jewell accompanied Ken on many of his flights, and was his co-pilot both in and out of the skies. Jewell is survived by siblings Dorothy Burgett, Pearl West, George H. Bennett, Orby Bennett, LaJoy Tubbs, Arnold Bennett, Ann Frye, and Ruth Walker; her children William Griffith, Kathryn Swanson, Michael Griffith, Khrystina Cothern; stepchildren Walt and Keith Beck; grandchildren Alicia Gervin, Brandy Moreno, Michael Beck, Robert Beck, Joshua Beck, Mary Beth Beck, Jennifer Beck, Lisbeth Ramirez, Julian Payan, Vanessa Serna, Christopher Cothern, Ruby Griffith, and Richard Swanson; great-grandchildren Michael Vander Tuig, John Gervin, Ashley Gervin, Andrew Vander Tuig, Robert Gervin, James Gervin, Joshua Vander Tuig, Lynzee Vander Tuig, Lenthonio Ramirez, Micael Serna, Eleazar Serna, Isabella Beck, Sophie Beck, Kenneth Beck, Daniel Moreno, Joseph Moreno, Milagros De Dios, and Jewelie Moreno; and great-great grandchild Cali Jewell Vander Tuig. This blog is now located at http://drops.vanessaontheweb.com/. Mornings are blissful because I have no pain. My legs feel a little stiff to start out, but that fades away with the busy happenings of the morning. There are showers to be taken, lunch to be packed, children to get to school, and traffic to be battled before arriving at the office. I can work comfortably for about two hours, then the pain starts as a dull ache in my right hip. The ache lingers. I know it's coming. I take walks, and that makes it feel better for as long as I'm walking. I've walked around the business complex three times today. The pain extends its tendrils down the back of my right thigh and causes the toes on my right foot to tingle. Sitting becomes torturous, and I get up regularly before it's unbearable. I can't take NSAIDS like Advil, Aleve, etc. because of the risk of intestinal bleeding so soon after my surgery, yet I have sciatica. The pain is intense and increases as the day goes on. The hydrocodone apap (acetaminophen) prescribed post-surgery doesn't do anything for it. I read the bottle intently as though somehow I'm taking it wrong. How could something that is considered a controlled substance not be effective. But what do I know of medications. I'm taking it every six hours, as recommended. I don't want to take any more. I don't want to become addicted. I don't want to use it as a crutch, so I carefully take only what I'm told to. I hate this. My only relief is laying down. I spoke with my doctor, and he prescribed me a medication that's supposed to work on the sciatic nerve, but on day two, and I don't feel the benefit. He also requested physical therapy from my insurance company, but as of right now, I'm still waiting for approval. This is my response to a comment my friend made regarding Pat Robinson's most recent debacle regarding why he thought that Haiti was stricken by earthquakes. "And you know, Kristi, something happened a long time ago in Haiti, and people might not want to talk about it. They were under the heel of the French, uh, you know Napoleon the 3rd and whatever, and they got together and swore a pact to the Devil. "And, uh, they kicked the French out, you know, with Haitians revolted and got themselves free. But ever since they have been cursed by, by one thing after another, desperately poor. That island of Hispaniola is one island. 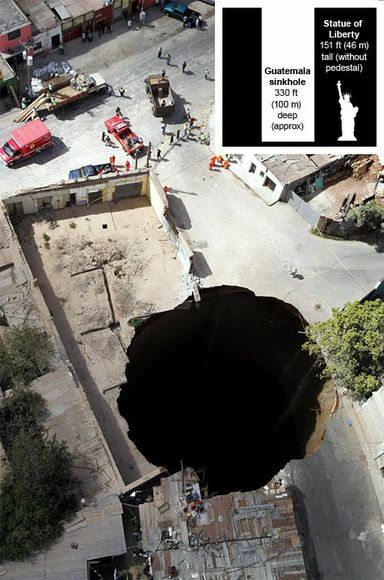 It’s cut down the middle. On the one side is Haiti on the other side is the Dominican Republican. Dominican Republic is, is prosperous, healthy, full of resorts, etcetera. Haiti is in desperate poverty. Same island. They need to have and we need to pray for them a great turning to God and out of this tragedy I’m optimistic something good may come. But right now we’re helping the suffering people and the suffering is unimaginable." Here is a link commentary about the broadcast in question. Here is a link to the video of his broadcast. She said, "I do believe he (and those like him) are a plague on the Reputation of Christianity." A group of U.S. Christian missionaries went to Uganda saying they were experts on homosexuality and that homosexuals were trying to destroy the "normal" family, so they proposed laws that homosexuals should be executed. Article here. In California, the biggest backers of Proposition 8 was a coalition of Mormon and Catholic churches. In fact, "The e-mails and other memos detail the Church of Jesus Christ of Latter-Day Saints' involvement in Proposition 8 -- for instance, that there was at least one LDS volunteer working in every California ZIP code." This prompted an upsurge in anti-gay violence. An article regarding their involvement is here. During the Bush administration, and because of the Republican party's view on family planning, funding for birth control was reduced not just in this country but for Africa. Here is an article about the cuts. And here is another article. "Bush's mammoth global anti-AIDS initiative, the President's Emergency Plan for AIDS Relief, poured billions of dollars into Africa but prohibited groups from spending any of it on family planning services or counseling programs, whose budgets flat-lined." And most recently, there has been a backlash against a gun sight manufacturer who was putting Bible verses on their gun sights. They were under exclusive contract with the US military and used in Afghanistan and Iraq. Now the militants in those countries have one more reason to say that the United States is trying to fight a holy war - Christianity vs. Islam. Pat Robinson is just part of a huge group of people who make this country and the Christian faith look bad. I am agnostic, but I was once a devout Christian. A Sunday school teacher for many years. I would never want to go back. Read the article here: BBC News. Google is quickly extending its purportedly beneficent tentacles into every facet of our lives - at least our electronic and telephonic lives. I personally use Google Docs, Chrome, Gmail, Calendar, Earth, Translate, and I would love their new Nexus phone. Despite my slight resentment on this daily encroachment by one company, I love their services so much, I shall continue to use them. There are many benefits to using their service. They are free and they do promote open development. So when I heard that Google is standing up to China because of hacks to the accounts of reporters and human rights activists through their Gmail service, I couldn't help but feel relieved that they are taking such a tough stance. Their rejection of China's censorship is an affirmation of my loyalty. Granted their altruism might be motivated by desire for a greater market share, but I would rather think it was not. I would rather think that they came to their senses and realized that what they were doing was wrong and they wanted to remediate the situation. Many people scoff that they only have 30% of the browser market share in China, and thus their actions won't hurt China. Those people don't understand that for a foreign company to have 30% of the market share in China is actually a great feat. They have made inroads in a country where many outside business fail. It will hurt their bottom line to pull out of China -- another reason why I hope their current battle cry is for the people of China, and not to line their pockets. "Google is definitely an interesting company with an almost unprecedented ingenuity and growth in modern computer software tech. Only Microsoft itself has taken such command of the markets. As people pat the company's back for taking a stance against the dictatorship, they could use a reminder that Google had no problem with censoring and helping to block internet traffic, information and browser searches until its own product, Gmail, happened to become a target of espionage. Those 30% of the browser market were only possible because Google gladly crawled for the despots and sold its software there - on Chinese censored terms. But I guess since all foreign companies in any industry have to do the same to gain any ground on that potentially massive market, that makes it alright. I'm not boycotting Google (great products! ), Yahoo or any number of companies for earning a buck while brown-nosing tyranny, but I won't applaud them for taking such minor action after years of condoning and appeasing censorship." Michael brings up excellent points, but again, I hope Google's stand against China doesn't flag, but bears some fruit for human rights in China. The non-denominational christian church I was a member of as a child and young adult required women to wear veils when in temple, to wear no jewelry nor makeup (ever), to wear dresses and/or skirts that extended to the ankles, to not cut one's hair, and to be "modest." It is not common in the United States to see women like that. While I am no longer christian, nor do I feel I should follow those mores any longer, at the time, I felt it was my duty to my god and an expression of my faith to follow the dress prescribed to by my church. While Islam does not require the niqabs nor burqas, and I personally feel that modesty is what one makes of it, if these women choose to follow a custom that they feel makes it easier for them to be faithful to their beliefs, then a government has no right to infringe on that choice. When I was of my faith, I would not wear pants, and my country would not make me do so. As long as the women and men follow the rules of France, they too should be allowed to dress as they please - especially as it is for a faith in their god and not because they are part of some nefarious gang or for a ridiculous fad. More importantly, any woman, Muslim or otherwise, should not be denied citizenship because they have not assimilated to the "culture of France." France has a reputation for being a beacon of peace and freedom. To suddenly require that a segment of their population "assimilate" to look like every other French citizen goes against everything that the country stands for. France has a vivid tapestry of citizens, of every color, of every religion, and from most corners of the globe. What exactly are immigrants supposed to assimilate to? I want to reiterate that I do not believe women should have to wear these types of coverings nor the type of clothing I wore when I was christian to prove that they are good women and faithful to their god. A woman can be immoral and immodest even if covered from head to toe. A woman can be unfaithful, even if wearing no makeup. A woman can be vulgar and think awful things, even if she never cuts her hair and wears skirts down to her ankles. Faithfulness to a deity is dependent on one's inner workings...not a facade shored by a type of clothing. While taking religious studies, I took courses about Islam, Christianity, and Judaism. I wrote essays about the oppression of women through dress. I will be posting these essays soon, but no where in these essays do I take the position that these methods of dress should be abolished. My disagreement with oppressive dress -- from christian Mennonites and Catholic women religious (nuns) to the women of Islam -- does not mean I have the right to dictate their removal. I didn't realize how much I had missed tutoring. Tutoring my cousin Geneva in geometry. She had a couple of light bulb moments. Such a rush. Dolphins have been declared the world’s second most intelligent creatures after humans, with scientists suggesting they are so bright that they should be treated as “non-human persons”. There are so many things I want to say about this article that I will probably write another blog post or at least a longer one, but I mentally staggered under the realization that if scientists were to find a species similar to a dolphin on another planet, they would be attempting to communicate and would be wetting themselves with the discovery of such an intelligent animal. But on our planet, where we have MILLIONS of living things, each with complex social systems, unique biology and interactions, we think we are so great and so above all other living animals that we are JUST now realizing that intelligent animals deserve to be treated with respect. How about respecting ALL animals? How about discovering just how intelligent they are instead of coming from the prospective of trying to justify our treatment of them? How about respecting humanity for that matter? How about accepting our racial heritage but acknowledging our intrinsic affinity for each other as humans? How about respecting sexual preferences? We get excited that there might be bacteria living in the rings around Saturn, while we drive complex organisms like whales, bird species, tigers, elephants, and dozens more to extinction. It makes no sense.